Despite last night was in a chaos due to the petrol hike announcement by our not-so-popular PM, Pak Lah, life still goes on. I simply think that this is the time to change our lifestyle and live moderately. I wouldn't want to comment so much about this issue as I want to stray away from talking about anything political in this blogosphere. There's too much about it already. Fernando Verdasco a popular key word in hcfoo.com this week. Throughout this French Open weeks, there has been quite a surge in my blog traffic this week especially on Spaniard Fernando Verdasco. And 'Nadal naked' still remain as a popular key word here. I'm still trying to blog about tennis as much as I can but time does not permit me to do that often. I'm sure I'll have a great time watching women's final too. So how do I choose? 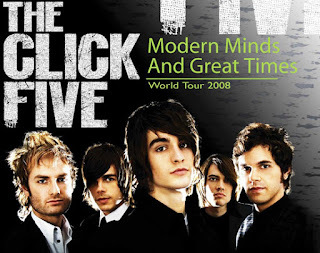 Hey, I've just won 2 'exclusive' tickets to watch The Click Five concert at Genting Highlands this Saturday night. Anyone going? I don't really know their songs except 'Jenny' and 'Happy Birthday'. Wait, if I go, then I'll have to miss the women's final!